When I was writing The Dancing Girl and the Turtle, I thought I knew the difference between a qipao and a cheongsam. Both, to be sure, were dresses for women. But in my mind, the former was figure-hugging while the latter was loose. I wanted to use that distinction to show how my main character Anyi evolves from country girl to dancing star. a close-fitting woman’s dress with high neck and slit skirt; cheongsam; mandarin gown. One term is Mandarin, the other is Cantonese. There’s no fashion statement being made here. 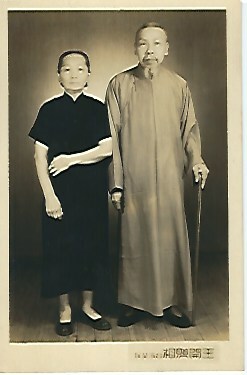 The Cantonese term cheongsam can also be translated into the Mandarin chángshān (长衫) or long shirt. In that case, the term refers to an unlined long gown worn by men. Here is a photograph of my maternal great-grandparents. See the similarity in their clothes? Her dress isn’t quite form-fitting but it’s got more shape than his. He’s wearing an ankle length gown and what appears to be a matching skull cap. Before Western suits were introduced into China, a chángshān was the sort of thing you would wear to a wedding, attend a funeral or have your portrait taken. I don’t know when or where this photograph was taken. Maybe in their home province of Fújiàn (福建) around the turn of the century? That would place this photo in the last years of the Qing dynasty. Hong Taiji, a Manchu general, founded the Qing dynasty in 1636. The Manchus reigned until 1912. They expanded the borders of China to cover what is now modern China, Taiwan and Mongolia. They also enacted other, smaller changes. all Chinese men should shave their foreheads and have their hair braided in back in the Manchu-style queue […] Further decrees ordered the Chinese to adopt the Manchu style of dress – high collar and tight jacket fastened at the right shoulder. By the second half of the 19th century, the Qing dynasty began to decline. The Opium War of 1839-1842 ended in the Treaty of Nanking and the opening of five treaty ports. In Fuzhou, Xiamen and Ningbo, trade with the West was disappointing. In Canton, there were riots and militia attacks followed by British reprisals and reciprocal atrocities. Of the five new treaty ports, only Shanghai became a boom town when extensive ‘concession’ areas of marshy and largely uninhabited countryside were made available for British, French, and other foreign settlements. This boom period could never have happened without the cooperation of the Shanghainese. Pan says the Shanghainese were tolerant of foreigners because so many of them were immigrants too. One need not be born in Shanghai to identify as a Shanghailander. A trait attributed to all Shanghainese, native or assimilated, was their love of the new. [W]hat was smart and what was in vogue were inextricably intertwined with what was modern – or modeng, as the Chinese called it. […] ballroom dancing, brilliantined hair, crimson lipstick, multi-coloured nail polish, automobile, Western-style villa, Western food, handbag, high heels, falling in love, feeling depressed and so on. Pan calls this love of the modern Shanghai Style. It was an aesthetic that reached its peak in the 1920s and 30s. It deeply influenced painting, printing, advertising, all forms of industrial design and, of course, fashion. The fashionable Manchu jacket gave way to a longer, looser gown before finally evolving into the qipao. 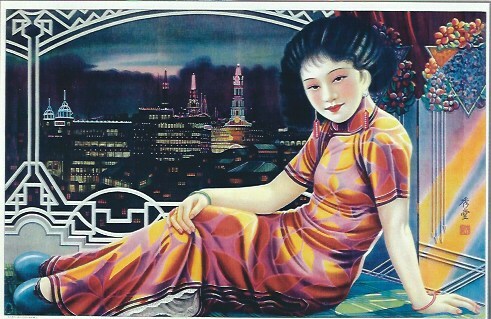 Wearing a qipao in those days was more than a fashion statement. It was a declaration of war on all things old-fashioned. For my character Song Anyi, wearing a qipao was a rite of passage. Her cousin Cho is happy to facilitate this transformation. He brings Anyi to his mother’s favorite dress shop. Listen to him talk. My brothers and I addressed my maternal grandfather in Mandarin as waigōng. It would have made sense to use the Mandarin wàipó (外婆) for our maternal grandmother. Instead, we called her Nabu, using the Shanghai dialect. We never questioned this choice. We didn’t understand the dialects spoken in our home, let alone the consequences of choosing one over the other. Nabu was quite the fashionista in her day. This is a portrait taken at an unknown place and time. Let’s just say it was Shanghai since she did live there in the late 1930s and mid 1940s. Check out her form-fitting qipao, the high-heeled sandals and matching handbag. When Nabu moved to the United States in 1959, she quickly adapted to the local fashions. She went mod in the 1960s and wore power suits in the 1980s. But her qipao’s never changed. Their style seemed frozen in a particular time and place, maybe Hong Kong in the 1950s? Imagine Maggie Cheung trudging up the stairs of the Mid-Levels, just as Tony Leung passes her on the way down In the Mood for Love. 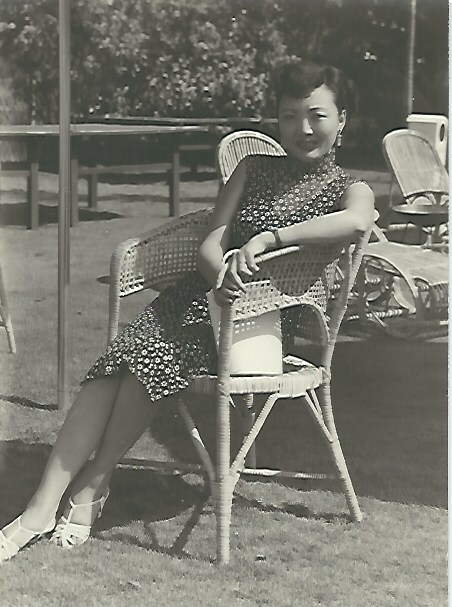 For any formal occasion, my grandmother and mother would always wear a qipao. They adhered to the dress code of my great-grandparents, while my father’s side of the family opted for Western wear. 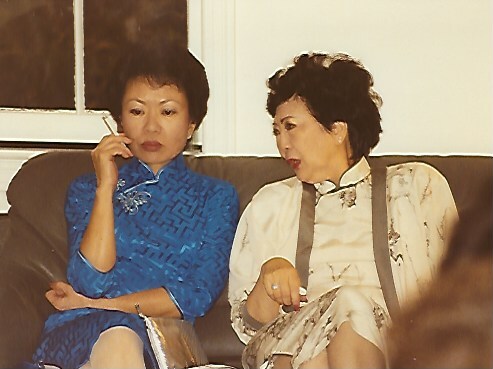 Here is a photo of my grandmother and mother, wearing a qipao at my wedding. When I was a kid, I would play among my mother’s dresses. I don’t think I ever dated to put one on though I did teeter around on her high-heeled shoes. Neither of us can fit into those qipao nowadays. I wonder sometimes whether we should sell them. They are, after all, relics of a past. By 1949, the year of the communist victory, Shanghai Style had had its day. 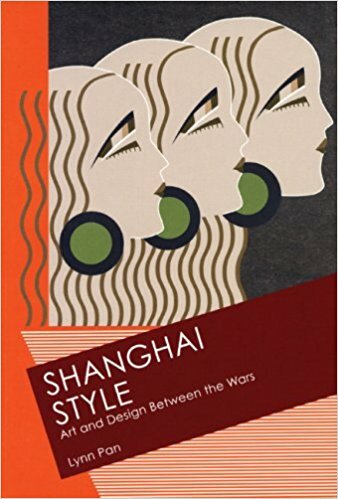 The passing of styles is a familiar story everywhere, but Shanghai Style was a chapter not so much ended as blotted out, excised by fiat from the collective memory along with an entire way of life. Between 1949 and the start of the reform era in the late 1970s, it was written out of history as though it had never happened.